The first shot fired by the British army during the First World War was not on the Western Front but in the tiny West African country of Togo, then called Togoland. It took place on 7 August 1914, three days after Britain declared war on Germany. Responding to shots fired by the German-led police force, Lance Corporal Alhaji Grunshi of the Gold Coast Regiment fired back. He went on to serve in the British Army in two further campaigns in Africa – Kamerun and East Africa – rising to the rank of Company Sergeant Major, and survived the war. Why did hostilities start in Togoland? 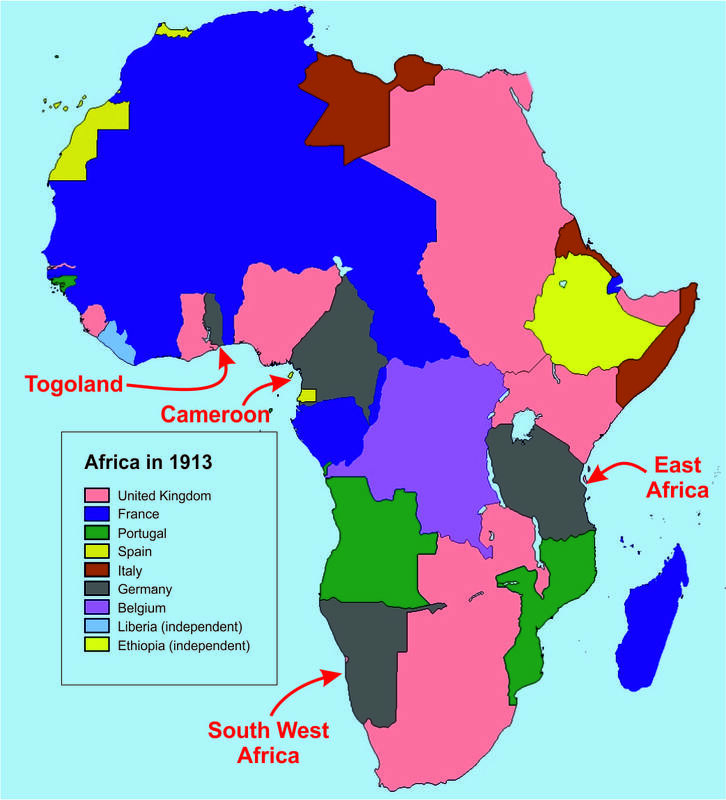 Togoland was a small German colony surrounded by British and French colonies. Situated here, in the age when radio communications were just beginning to take off, it was a key link in the chain between German shipping in the Atlantic and the German colonies in Kamerun, East Africa and South West Africa. Another factor was the colonial rivalry between Britain and France. Colonial governments sometimes felt that the war in Europe was not relevant to them, and feared that the impact on the colonies would be disastrous to trade and to relations with indigenous populations. In West Africa, France controlled more territory than Britain, and had correspondingly larger colonial forces available for action. The possibility that the weaker German colonies would fall to France worried the British colonial office, so Britain rejected German requests that the colony should remain neutral and acted quickly to invade. The Togoland Campaign did not last long. For once the prediction ‘it will all be over by Christmas’ held true: in fact it was all over in three weeks. There were only about 700 German troops – actually Togolese paramilitary police, led by German officers – available to defend a country the size of Ireland. They faced 600 British and 500 French troops (colonial Senegalese Tirailleurs). In addition – as with all the African campaigns – the colonial troops were supported by much larger numbers of native carriers. Following the declaration of war on 4 August, the British advanced across the border from the Gold Coast. 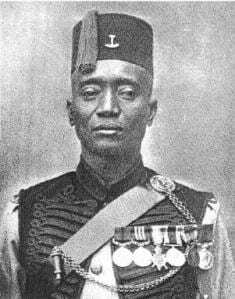 It was in a skirmish during the march towards the capital, Lomé, that Lance Corporal Alhaji Grunshi fired the first British shot of the war. The following day the British force took Lomé and the German force retreated north to defend the important radio station at Kamina. There were two relatively brief engagements – at Agbeluvhoe on 15 August and at Chra on 22 August. In both cases the Germans were forced back and many of their colonial troops deserted. 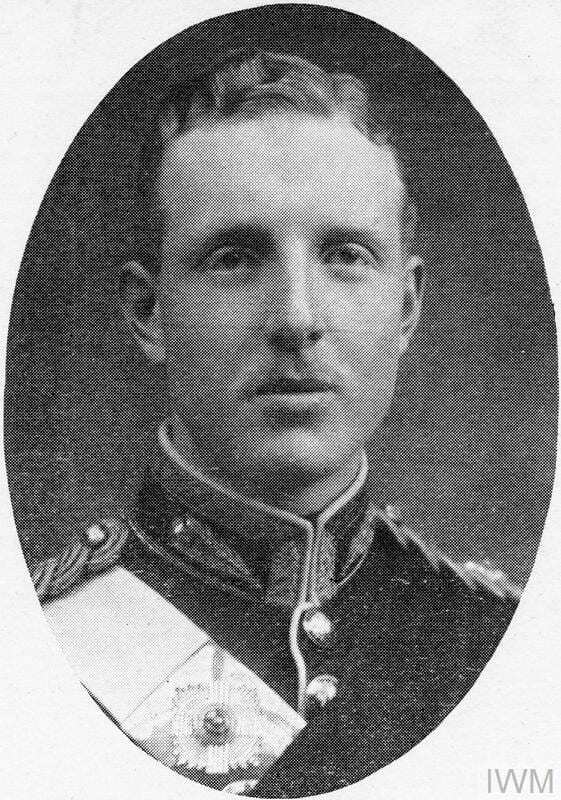 At Chra, there was another first – the first British officer to be killed in action in the First World War, Lieutenant George Masterman Thompson of the 1st Battalion Royal Scots, seconded to the Gold Coast Regiment and temporarily in command of a troop of Senegalese Tirailleurs, twelve of whom were killed alongside him. 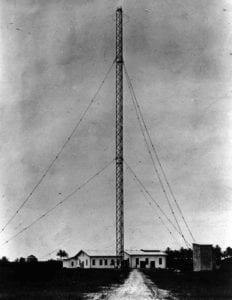 Finally on 25 August, accepting that defeat in Togoland was inevitable, the Germans blew up their radio station at Kamina and surrendered. Already 229 messages had passed through the station since the start of August and it has been argued that its loss influenced the German naval defeat at the Battle of the Falklands Islands four months later, as the British were able to use faked transmissions masquerading as coded German messages to lure the German ships to the battle. 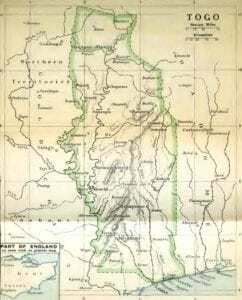 The French and British split Togoland into two, with the British taking the north western part of the country and the French taking the larger south eastern part. After the war these areas came under the League of Nations Mandate system. Click here for a much more detailed article about the Togoland Campaign by Harry Fecitt, military historian and expert on the First World War in Africa.